Here are just a few lemonade ideas I came up with today just playing with my testers in the kitchen. We needed a bit of something to quench our thirst, so we just played with these. Add sliced ginger for an additional “zing” to your everyday flavor. Use club soda instead of mixing in water to the lemonade frozen mix. It’s funny that you’ve posted this because just last week I finally started mixing different ingredients into my lemonade because to tell you the truth I’m just not a fan of regular lemonade. I added mint leaves, watermelon chunks, and cranberry juice, and it came out great! I really like the idea though of adding pureed watermelon because the chunks I was using just infuse the lemonade with watermelon flavor, but I bet the puree is just delicious mixed in evenly! Watermelon is SUCH an amazing flavor to mix with lemonade! I mixed seltzer water, watermelon puree, and lemonade all in one drink this past weekend, inspired by this post, and it came out totally amazing. I also sweeten my lemonade with agave instead of sugar. These sound like awesome tips. There’s something about lemonade that just says summer, isn’t there? Just like how hot chocolate says winter. @June it’s a great tip to use agave instead of sugar. The kids get so much less hyper and you can’t really taste the difference. I used to use stevia but there was a weird aftertaste. Just wanted to recommend finding cute glasses to serve your lemonade in and add some colorful umbrellas too! I serve it in martini glasses, which I never use for martinis or anything else, and my kids feel so special drinking out of these and adults do too! It’s funny how much the presentation of something can make it so much better received! Does anyone have any summer food tips of things that go well with lemonade? I like to snack a lot but not on anything heavy during the summers, but I’m looking for some new ideas. Hi Tina this is a great compilation of ideas here. I would love to hear more about fun ideas for summer snacks and beverages if anyone has any ideas let me know! We are throwing a pool party for my daughter Katya at the end of the month and I want to get really creative. Thanks! Some terrific ideas! 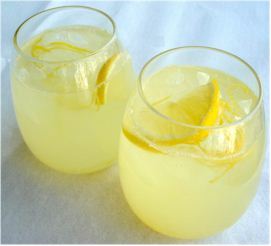 Here’s another great article on things to do with lemonade that I found: Some ideas include adding kiwi puree, fresh ginger, and garnishing the rim of the glass with lemon drops and sugar! Great ideas. I’m more of an iced tea person. I am inspired however to add lemonade now to my iced tea. Oh what do you know? Looks like I just had a lemonade idea of my own! I used to have lemonade all the time but I’ve been having iced tea now instead of it because there’s antioxidants and I sweeten it with stevia. I highly recommend it. I squeeze a bunch of lemons in it sometimes too. @Abbie Wowee that was a FANTASTIC link. Everyone check it out! I liked the ones you recommended too. Time to make some lemonade! Thanks for the ideas. Can’t wait to try these! @Abbie Weathers No kidding. That was a great link!